Most of the reading I did before I travelled to Tahiti involved barques and frigates named Endeavour and La Boudeuse, vessels bearing the 18th-century European visitors who thought they’d found paradise. They hadn’t, of course, though that didn’t stop their arrival from changing everything in a civilization that had been in place for nearly 2,000 years. I see now that I should have concentrated on studying more everyday vocabulary to help me through my visit, maybe delved deeper into French Polynesia’s modern colonial history. Instead, I spend much of the eight-hour Air Tahiti Nui flight from Los Angeles catching up on Captain William Bligh and his 1787-89 mission aboard HMS Bounty to secure breadfruit seedlings for export to England’s Caribbean colonies. Maybe you remember the story, or one of the movies, but it didn’t go so well: every version leads to infamous mutiny. Eventually, I extract myself from the history of early European intrusions to prepare for my imminent own. I don’t pick up much, in the end. By the time I land at Faa’a International Airport on French Polynesia’s busy main island, Tahiti, the only local phrases I’ve locked down are ia ora na (good morning) and mauruuru (thank you). Whether you come better prepared, this is your starting line, the centre of business and commerce, home to the capital city, Pape’ete. While the whole assemblage is often informally referred to as Tahiti, French Polynesia is the approved designation for this scattering of 118 islands and atolls, about half of them inhabited. 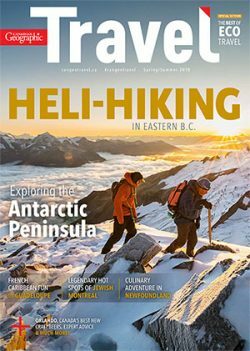 Cast across an expanse of Pacific Ocean as broad as Europe, the islands are grouped in five archipelagos: Society, Austral, Tuamotu, Gambier and Marquesas. The population totals 280,000 or so, which is roughly twice that of Prince Edward Island. You can trace the association with France back to Captain Louis-Antoine de Bougainville and his 1767 arrival. Since then, French Polynesia has been, variously, a colony, protectorate and overseas territory. Today, it’s technically — awkwardly — termed an overseas collectivity. My first morning in Pape’ete is lustrous. That’s not a word I use lightly, but I overhear it back at the airport, waiting in line to pass through security and begin a journey that will take me to four other islands — Raiatea, Taha’a, Moorea and Fakarava — in seven days, and it seems right. 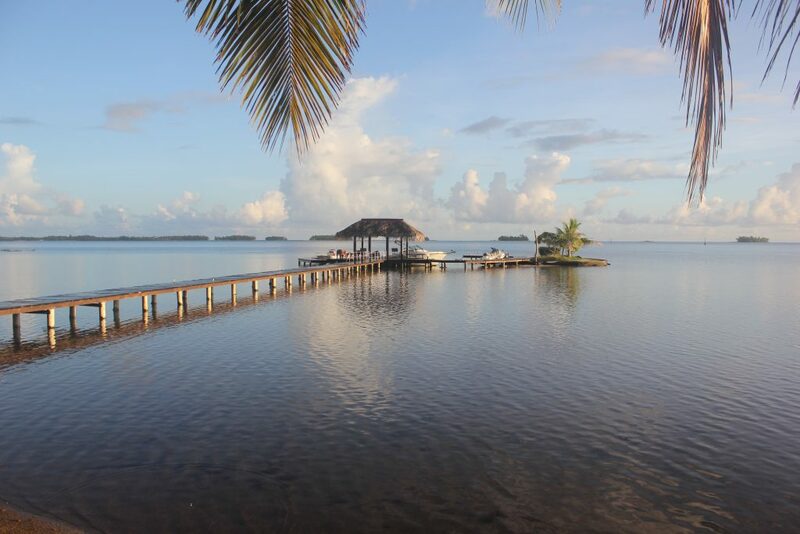 Early analysis: the spell that Tahiti casts has a familiar tropical recipe, wherein equal parts sun and ocean and sand mix with an abundance of first-time visitor’s awe to make you feel perceptibly freshened and improved. As a visitor, you hear a lot in French Polynesia about mana, the spiritual power that this place generates, its natural-born wisdom, its mystery, its truth. Is that some of it? Maybe. Meanwhile, I’m not shedding the 18th century so easily. As we rise into the bright of the morning, my thought as I thank the flight attendant who offers a bracer of papaya juice is, Yes, good to start the day protecting against scurvy. You think you know your colours thoroughly enough, but the ocean in Tahiti dumbfounds the palette you’ve been working with all your life. 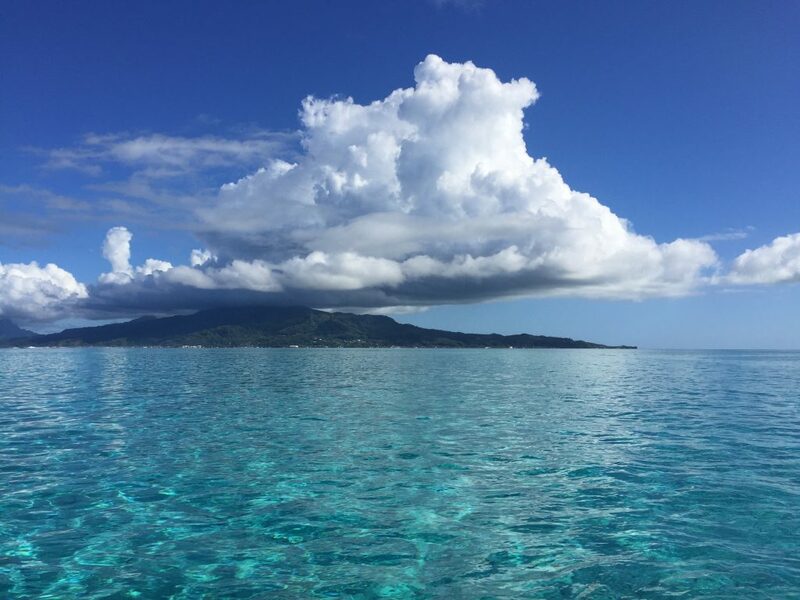 As we bank over Moorea, I watch a keelboat sail through an inner-lit blueness that must be regular saltwater, though I’ve never seen anything like it before. French Polynesia will keep this up throughout my stay, enhancing colours and textures, amplifying the extent and 4K-depth of horizons, increasing their limitlessness, finding new ways to make elements as old as weather and nightfall seem like surprises. The blue, I think, is cobalt. It is, to be clear, very blue. The sun sits high as we arrive at our destination, marae Taputapuatea, and it’s pulsing so hotly as Rota parks the van and leads me to the shore that it feels like it’s dropped down to join the tour. A marae is a sacred enclave, a temple for worship and sacrifice, an intersection for the living to commune with their ancestors, a place for royal gatherings and celebrations, a source of mana and its sanctuary. After a lunch of tartare de thon au guacamole at Villa Ixora, a serene bayside guesthouse with a shady restaurant that’s on the way back toward Uturoa, it’s on to the town’s wharf, where I can see Taha’a, my next destination, highrising across the narrows, the slopes of its mountains lushly canopied by acacia. Taha’a has no airport, so I motor across in a whaler steered by Pascal Bailly, an expat Frenchman in his 50s. On the way, I have my notebook out to work on a tentative list of surrounding greens. Gauguiny-emerald, supermint, too-ripe pear, extreme-Kermit … I don’t know that I’m making a lot of progress with my colours: as has been the case since I arrived, nature continues to overwhelm language. I kick off mine and wade out for a swim before settling in on the pier to see how the sun sets over Bora Bora. Who’s a painter who paints like this? You’d have to take care: these are garish Halloween colours we’re dealing with here. The night’s darkness fills the ocean first, waiting for a cue to drain upwards. The sky oranges and pinks before it — dramatic celestial pause — purples. In a few more minutes Bora Bora is replaced on the horizon by a powder of lights. I make it through the night undisturbed, if none the wiser about what I was guarding against. I have a busy two days ahead of me on Taha’a, steered by Samuel Tamaehu of Heremana Tours. On the water, Tamaehu aims the bow of his boat out into Taha’a’s northeastern lagoon. Many of the Society Islands are encircled by reefs, which themselves are often dotted with motus — tiny islets so idyllic in their palm-treed white-sandiness that they could be masquerading as clichés. Anchoring motu-side in waist-deep water, Tamaehu splashes down ahead of me, slapping the water to alert and bring on a bevy of — three, four, five, six — stingrays. Zooming black and flat around us, the rays resemble nothing so much as stealthy doormats. Friendly ones, though. As long as you leave their barbed tail-ends alone, you’ll find them as playful as puppies. We move into deeper water and I don mask and flippers to explore the byways of a coral garden. The lambent cobalt I was looking at yesterday from the air is a gleaming turquoise now that I’m in it, and I’m satisfied to let the colour absorb me. My boat tour ends and we drive to Tamaehu’s house for lunch, a traditional Sunday feast centred around an open fire-pit known as a hima’a. Hot from the coals, there’s pork and chicken, taro (think sweet potato) and jackfish roasted in palm leaves. Tamaehu conjures the poisson cru: raw tuna, tomatoes, onion, doused in coconut milk and lime juice, mixed by hand. I help myself to a generous serving of Thanksgiving stuffing that turns out, instead, to be my first taste of breadfruit. I’m a quick convert. Afterward, we hoist javelins at a coconut fixed atop a six-metre pole, and in terms of ridiculous fun, my provisional opinion is that there may be nothing better. Yes, Tamaehu hits the target every time while no, I’m not even close. There’s a jolt of the wrist and a follow-through to his underhanded release that I can’t quite master. “Practice at home,” he tells me. My second day on Taha’a gets underway with a visit to a distillery, Domaine Pari Pari, established in 2005 by yet another displaced Frenchman, former vintner Laurent Masseron, who uses six different varieties of local sugar cane to distill rhum agricole. The tour of the property ends auspiciously, with the sweet, brown fleeting burn of a requisite morning shot of rum. 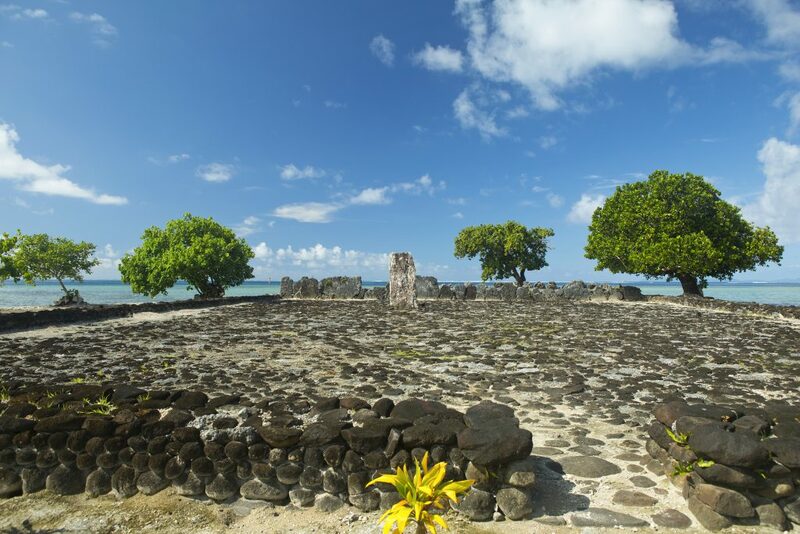 If rum-making is a relatively young industry in Polynesia, Taha’a is home to more traditional enterprises as well. Along with coconut oil and vanilla, the pearl is one of French Polynesia’s principal exports. Near the island’s busiest quay on the waterfront of Tapuamu Bay, I walk the pier out to the stilted huts of the Iaorana Pearl Farm, Taha’a’s largest. Most of the operation here is long-term and submarine, an ongoing story evolving amid 20 unseen hectares of oyster beds in the bay. I settle for a thorough dockside explanation of the meticulous five-year culturing method that will persuade these bivalves to foster black-lip pearls like the ones available in the farm’s shop. Like the Iaorana oysters, which are flown in from the Tuamotus, vanilla is an immigrant hereabout. Native to Mexico, the plant first arrived on Taha’a in or around 1919. 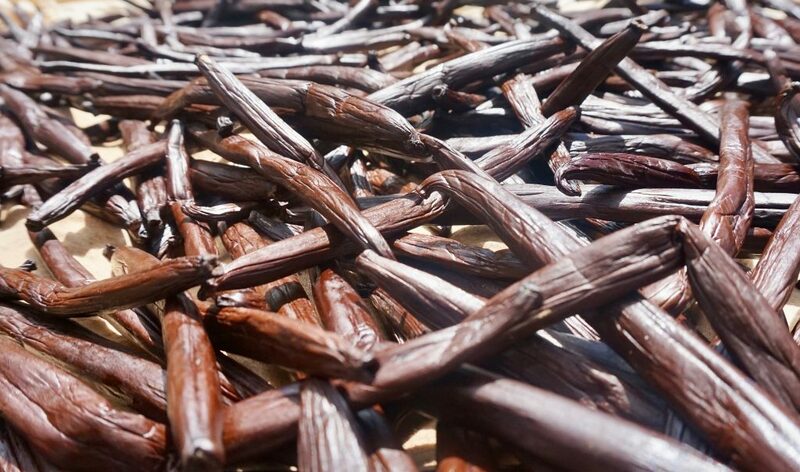 Today, it produces 80 per cent of French Polynesia’s vanilla, which accounts for a nickname I keep seeing: Vanilla Island. It doesn’t leave much to the imagination, it’s true, but I still feel a duty to investigate. A Dane, Brian Hansen, owns the plantation at La Vallée de la Vanille with his wife, Moeata Hioe. If, like me, you didn’t know that the vanilla flower is an orchid, the only one that produces edible fruit, Hansen will bring you up to speed. Sitting in for his lesson on vanilla cultivation, I learn why you have to fertilize or “marry” the flower by hand (Taha’a lacks the insects that would otherwise do the pollinating). For me, the whole experience is, in sum, all to the good. After the morning’s exposure to rum and shellfish, Hansen’s tutorial will lend me a desserty fragrance that will linger for days. Moorea, Tahiti’s near-neighbour to the northwest, is third-largest of the Society Islands. The ferry from Pape’ete gets you there in half an hour, which makes it something of a suburb: many people who work in the capital live here. My visit is all too brief, a single full day that I opt to spend on the water rather than hiking the island’s highlands. As it turns out, I don’t cavort with the whales: out with Maui Ciucci of Corallina Tours on his boat, I’m busy fiddling with f-stops on my camera when the humpbacks, mother and calf, breach nearby. 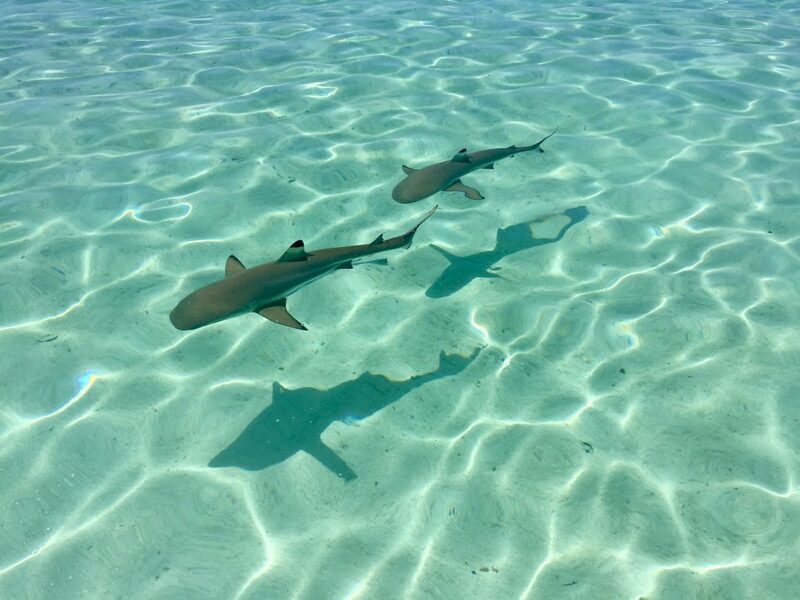 Later, within the shallow blue-green of Moorea’s encircling reef, I swim with blacktip sharks. Or rather, I splash in chest-deep water while the sharks show no interest in my presence. There are lonelier, farther-flung islands in these waters — Pitcairn, for example, where Bounty’s mutineers washed up, 2,000 kilometres to the southeast — but Fakarava, my last stop in Polynesia, feels conspicuously remote and exempt, perhaps, from the constraints of calendars and clocks. The second-largest island of the Tuamotu archipelago, Fakarava is a 60-kilometre sill of coral enclosing a lagoon vivid with aquatic colour and incident. Now part of a UNESCO biosphere reserve, it saw its first European visitor in 1820 when the Russian explorer Fabian Gottlieb von Bellingshausen sailed in and dubbed it Wittgenstein. The name didn’t take. For most of the hour-long flight east from Pape’ete, it’s only ocean stretched below, midnight blue now, and calm as carpet. When the first of the Tuamotus appear, they look like bleached, lonely bones. “So narrow, so barren, so beset with sea,” Robert Louis Stevenson wrote when he stayed on Fakarava in 1888. It’s true that after the fertile, lofty mountainscapes of the Society Islands, Fakarava, almost level with the Pacific enclosing it, does at first present a flat, blanched austerity. Walking the long shifting coral beach at Passe Garuae or riding a bike along Fakarava’s single ribbon of paved road, you feel its exposure to sun, wind and ocean. But Fakarava is greener than it first appears, festooned, even, in places, with frangipani and heliotrope. A towering sandalwood tree presides over the centre of Rotoava, Fakarava’s main village, like a benevolent, all-seeing elder. To get my bearings, I enlist a local guide, Enoha, who makes do with just the one name. An affable, 50-something painter who also sculpts driftwood and whalebone, he tours me from one end of the atoll to the other, stopping to comment on everything from pre-European settlement, modern-day airport lore, soldierbushes, ironwood trees, a fruit called soursop and the various uses for the leaves and bark of the breadfruit tree (a powerful antioxidant and an excellent glue for patching canoes, respectively). For supper that night I stop by the Pension Paparara, 20 minutes from Rotoava along the lagoon shore by bike. Over grilled parrotfish and a carpaccio of mother-of-pearl, I get talking to Jan Calta, a Czech programmer in his 30s who’s on his second visit to Fakarava, and spending as much of it as possible under water. “You’re not diving?” he wonders. He’s asking for himself, probably, but maybe also on behalf of common sense. Fakarava is renowned in scuba circles, several of which I’ll drift into, conversationally, while I’m here on dry land around suppertime. Though he stayed for just four days, the experience soaked deep. Everybody should come to Fakarava, he felt. He wasn’t painting, but he was drawing and writing — and pondering colours. I’m not surprised to learn, later, of his desire to distill the essence of what he was seeing in these southern seas. The predominant shade, he eventually decided, is the lambent blue of the morpho butterfly’s wing — his own favourite colour.